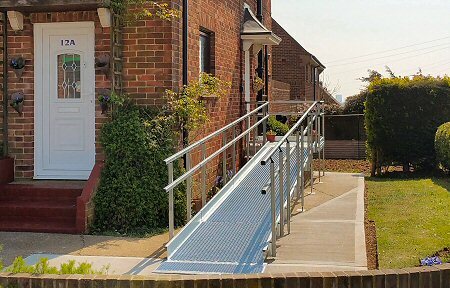 Managing Directors reply - Dear Councillor, I am pleased to hear that Mrs B’s new ramp has resolved her access problems. It was fortunate we were able to supply and fit the ramp in one day which avoided respite and fostering the dog. Thank you for your kind words. When I was told they were finally going to give me a ramp to access my home I had no idea I'd get such a first class professional job. Please let your young worker know how thrilled I am with his work, I am looking forward to seeing the reaction of the welfare officers when they inspect it. Thank you all once again. Managing Directors reply - Dear Mrs. Bowery, I am pleased to hear that your new ramp has helped with your independence, thank you for your kind words. May I take this opportunity to say thank you for the excellent work in putting in my shower. I would like to say Roger was a joy to get along with. He was always on time, kind, and polite and left the bathroom tidy. He is an asset to your company and hope he continues to work for you for many years to come. I have also written to Anchor expressing views on your work and to give a high commendation of your company. Thank you once again. Managing Directors reply - Dear Mrs Shaw, thank you for your kind words. Roger has been one of our most conscientious fitters for a number of years now, although our other fitters are just as good, just don't tell Roger! We get quite a few customers contacting us about Rogers standard of work, I will pass your thanks on to him. "Thank you for email about Mrs. XXXX's adaptation and works complete. I want to thank you for your quick and helpful response and for the way in which you personally oversaw the work particularly given all of the sensitivities in this case, genuinely, many thanks"
Managing Directors reply - We are always pleased to respond to those special cases that are out of the ordinary. Thank you. Wealdens have really stepped in and helped us out with what could have been a really difficult period. Only last week a resident phoned in tears because she had been waiting so long for a repair to be done. The order was passed to Wealdens and was complete within two days. The resident phoned back, overjoyed that it had been completed. She commented that your staff were very polite. Once again many thanks for the support that Wealdens has provided to Moat. Further to our telephone conversation, I would like to say a huge thank you to Pete for coming to our house to carry out our adaptation. He was so friendly, helpful and efficient; it was an absolute pleasure to find such a happy and helpful individual. He is a credit to your company. Many Thanks again for the services we received. Please be sure to pass on our gratitude to him. Managing Directors reply - Peter is another of our wonderful fitters. I am please to hear you are pleased with your new shower. I hope you enjoy your new found independence.